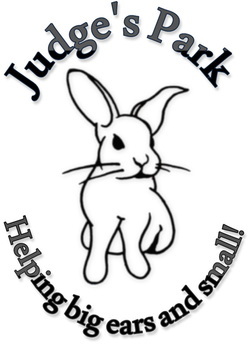 Judge's Park is a very small rescue, founded in 2005, helping as many animals as I can. Since 2005, we have found homes for over 1000 small animals! Currently, I am working out of my home, but hopefully will someday move to a bigger facility and start adopting out dogs, cats, horses, and other assorted animals! We are currently located in Edinburg, PA close to New Castle, Youngstown, and within an hour and a half of Cleveland and an hour from Pittsburgh. Appointments must be made. We are a certified 501c3 non profit. I sometimes accept rabbits, guinea pigs, and other small animals as we have room. I can also list small animals for you if you need to rehome yours and can keep them until they get adopted if you send me a digital picture on email and a description. WE DO NOT TAKE IN DOGS and very rarely take in cats (only emergency situations). Judge's Park is currently in desperate need of adopters and fosters. If you've ever thought of adopting a bunny or a guinea pig or other small critter, now is the time! We have many wonderful animals in need of their forever homes! Please email us at judges.park@yahoo.com if interested in fostering. We are currently offering that if you are looking to adopt a bunny as a companion for your current rabbit, the adoption fee for the rabbit being adopted will be lowered to $50. 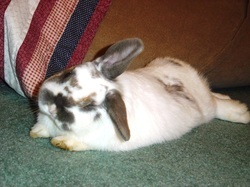 (All other single rabbit adoption fees are $60 which include spay/neuter, microchip, and first vet visit). Our bonded pairs are being lowered to $75 for the pair (adoption fees for a pair are usually $100). Please email using our contact form below for more information on adoption!! We DO NOT adopt out rabbits for the holidays or as holiday presents. Many times people think that rabbits are the perfect gifts, and they are without a doubt not. 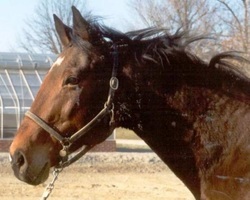 They are pets that require a lot of responsibility and attention, and they are not recommended for children under 10. They must have large size cages or 4' x 4' puppy pens with plenty of out of cage time. They should not be outside under any circumstances. They are too sensitive to temperature changes and predators and their life span is twice as long if they live inside. They must also be spayed and neutered, and must make trips to the vet if they are sick and/or not eating. They are not cheap animals. They require a specialized diet of hay, high quality pellets (without any added "treats"), and 2-3 servings of veggies a day especially dark, leafy greens. With that said, they make amazing, affectionate, litter box trained, wonderful companions, but you must do your research on them first. Please see www.rabbit.org for more information. Judge's Park is always in need of donations, be they supplies or money for vet bills and animal care. *Vegetables, especially leafy greens (spring mixes, dandelion, green/red leaf, etc. ****Rabbit/small animal toys , like baby toys, i.e. keys, blocks, rattle toys, stackey cups, etc., wicker balls, hay filled tubes, wood chewies. *Bedding, including Aspen bedding and Carefresh or other recycled newspaper bedding. -We do not accept donations of Pine or Cedar as these are dangerous for small animals. *Dishwashing soap and laundry detergent. We only use brands that are environmentally friendly and free of dyes, perfumes and chemicals. *Paper towels and carpet cleaners (again, all natural, free of dyes and chemicals). *Rabbit/small animal treats (anything from Oxbow or dried fruit with no added sugar). Donate to our vet bills through our paypal email address, Azeem0510@yahoo.com, or email us for our mailing address. If you feel more comfortable donating directly to our vet, we very much appreciate that as well. Contact us directly to find out when our next appointment is and where it is. Check out our rescue on Facebook! Want to show off your bunnies? 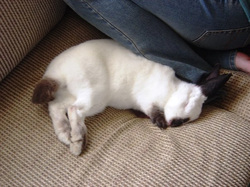 Bunspace is a great website to show off your bunnies, make new friends, and get questions answered about bunny care. All our bunnies are on there! 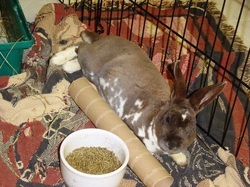 Visit the House Rabbit Society at www.rabbit.org for great information on housing, feeding and caring for your bunny and also information on medical needs and rabbit rescue!